You might think the life of a tech writer is all drugs, cash, women, and limousines, but that's a burdensome misconception. A few nights ago, while trying to reheat a pie, my toaster blew up. So I need this one. So I'm reheating this pie. It was a sad little pie, on sale atop a pile of other sad pies, all discounted. I believe it was $4, which is cheap for an apple pie. I was sitting on my couch with a friend of mine kind enough to eat this apple pie with me on this cold night. We sat and watched The Real Housewives of Beverly Hills in quasi-silence, pausing only to let out a strained breath—the walk up to my apartment had taken a toll. I was about to ask him when we both started to look so old, when my toaster exploded. The entire glass front of the oven burst forward in a blast that would have certainly gorily blinded me had I been staring at the pie, like some sort of pastry Oedipus. Luckily, I was on my couch, as I tend to be, far from the blast radius. I said, "Well," and started to clean it up. We cleaned most of the glass shards off the pie and ate it in silence—a double vacuum of both fear from existence and shock from appliance detonation. But here's a cheery thing: a Hello Kitty toaster. 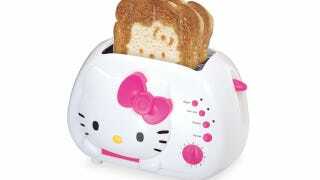 It's cute, and it'll burn a vague image of Hello Kitty into your toast. It has a reheat, bagel, and defrost mode, and it looks sort of like Hello Kitty, were she pressed into a hydraulic mold in the shape of a toaster. It has a four-star rating on Amazon, and is Prime eligible.